This example shows how to generate signals on an analog output current channel for a NI device capable of current output using the Session based interface. To discover a device that outputs current, click the name of the device in the list in the Command window, or access the device in the array returned by daq.getDevices command. This example uses a NI 9265 device. This is a 4 channel analog output current module and is device 5 in our system. This module is in slot 8 of the 'cDAQ-9178' chassis with the name 'cDAQ1'. Create a session, and use the addAnalogOutputChannel command to add an analog output channel to the session for generation. For the purposes of this example, add two current channels and change the session Rate to 100 scans per second. No data queued. Will run at 100 scans/second. The channels of the NI 9265 have a range of 0 to 20 mA. Ramp from 0 to 20 mA on one channel and set a constant 10 mA on the other channel. 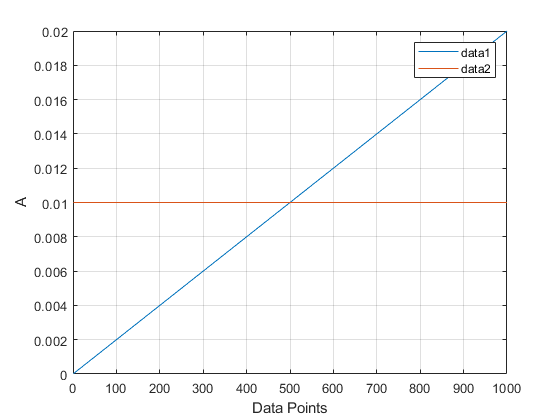 Generate 1000 points of data for each channel so that we get 10 seconds of output data. The queueOutputData command attaches the data to the session. The startForeground command starts the session. Since this example session includes only analog output, this command starts the output, and waits for the operation to complete. To reduce the duration of the output, you can increase the scan rate. For one second of output, change the Rate to 1000 samples per second. This will exhaust the queued data in one second.